I don’t do a lot of reviews of hard drives, but when I do I like to try really hard to break them. That’s why I enjoyed running over the ioSafe rugged portable hard drive a couple of months ago. When that thing still worked after I abused it so well, I asked them if they had any other fun stuff for me to try. 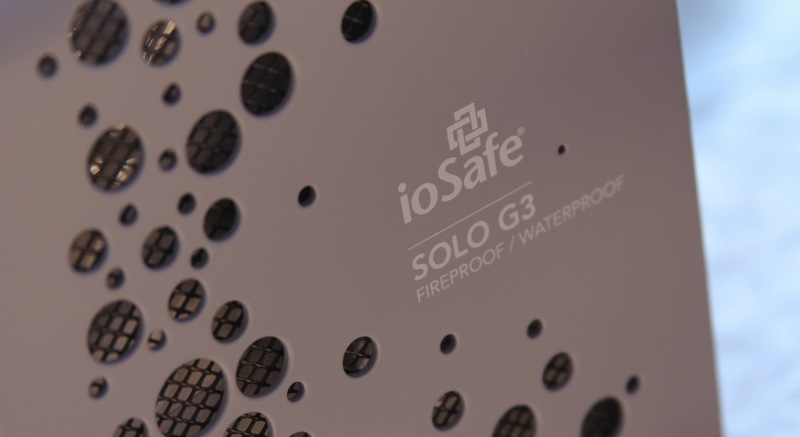 They came up with the ioSafe Solo G3, a drive that comes in a variety of capacities and features a ceramic encasement that claims to make it fireproof and a sealed bag that keeps out water. The thing is a beast that is far larger than any 1TB single-drive enclosure I’ve ever seen. Most of that bulk is taken up by an exterior shell that cradles a ceramic cocoon. Inside that cocoon is a hard drive enclosed in a waterproof bag. Basically, this thing is a tank with layers of armor designed to protect your data. The drive is completely silent and comes in capacities from 1-3TB. Due to the ceramic and outer shell, it’s almost impossible to get any drive noise out of it as well. It’s a silent monolith of data protection. Before I tested out its durability, I put it through some basic performance tests. 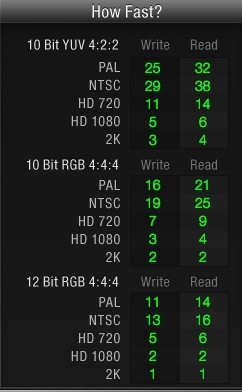 I don’t have access to any machines with USB 3.0, so I was only able to test legacy 2.0 speeds. It performed relatively decently, with write speeds of around 30 MB/s and read speeds approaching 40MB/s. It’s not going to set the world on fire with USB performance without a 3.0 port, but it’s definitely respectable. At 2.0 you’re not going to be using it for live writes of 1080P video, but you could definitely use it to stream video out to a source. 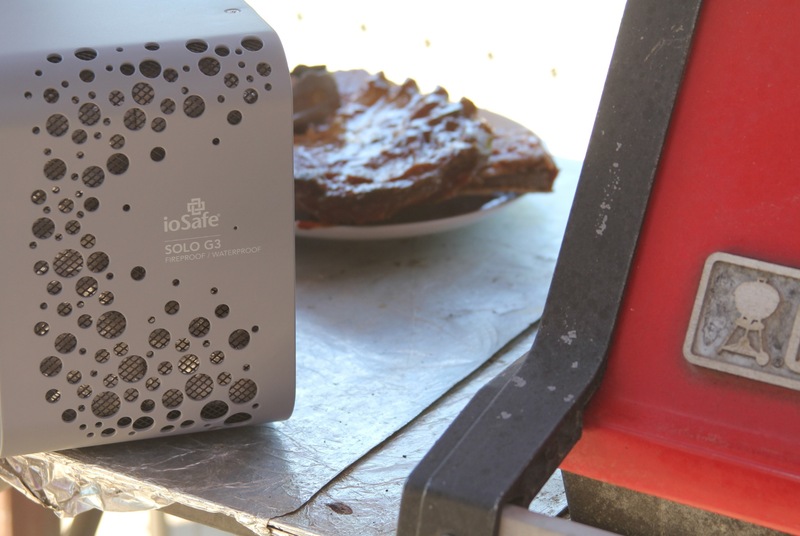 The ioSafe comes with a variety of protection goodies including protection from fire, water and theft. The company says it will handle 1550 degrees for 30 minutes, during which the DataCast mold inside uses time-release water vapor to help limit the temperature of the unit. The bag inside protects your data in 10 ft of water for up to 72 hours and there’s a Kensington lock slot on the back that lets you padlock your drive down if it’s in public. ioSafe also offers 1, 3 or 5 years worth of data recovery service if you need it. Because, while the drive itself is fireproof, you can bet that the plastic switch and ports on the back are not. That’s why I decided to give the drive a bit of a break and, when doing my testing, hang the back end of the casing off the edge of my barbecue. As the drive is centered towards the front of the case, I felt that this would still be an honest test of the fire proofing. 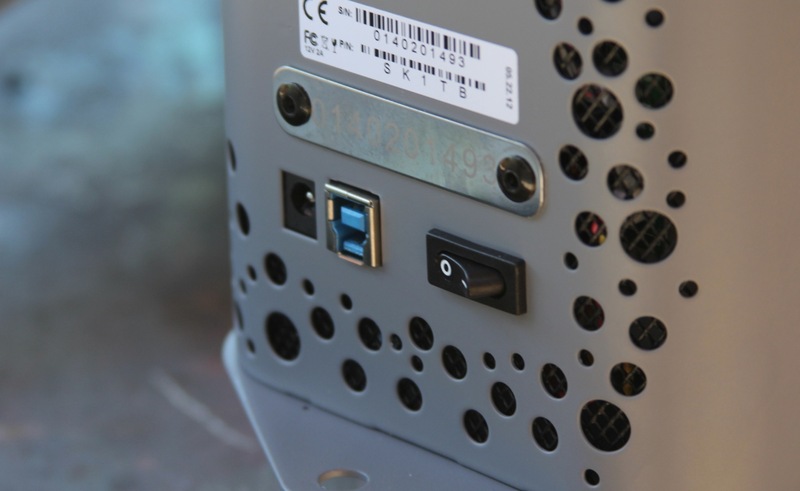 The ports and casing, after all, can be replaced, but the drive itself, with its precious data, cannot. I’d estimate that anyone with data this worth protecting would be glad to have a short service performed by ioSafe to swap the casing to a new one. So, it’s really not for me to say whether the Solo G3 would hold up to a whole-house fire, but it definitely survived the barbecue test. That’s not something that I think I could say for many other external hard drives. If you’re unconvinced by my ‘cue though, you can always check out this test where they let a car burn down around an older version and, with some port swapping, still got to the data inside. So, if you’re looking for a drive that will give you an added later of data protection in fire and rain, you might want to give the Solo G3 a look. At $299 for the 1TB model, it’s definitely pricier than other drives, which run closer to the $100-150 range for the same size. But what is a couple hundred bucks when it comes to irreplaceable data? And, if you decide to bump up, extra terabytes are only $50. Yes, I ate the ribs. No I did not eat the egg.